I have already made this appetizer twice. It is so simple to make and so delicious to eat. And leftover… I think it tastes best cold out of the refrigerator. This appetizer is inspired from Dorie Greenspan's: Tartine Saint-Germain which is basically the same thing without spice and on big pieces of bread as a sandwich. So, think large if you would like this for lunch. Enjoy this for Christmas Dinner or for your New Year's Party. Inspired by Dorie Greenspan's: Tartine Saint-Germain from "Around my French Table." 1) Spread the bread squares out on a cookie sheet and toast them under your broiler about 2 minutes on each side. 2) Spread horseradish sauce on each square. 3) Put about a half a piece of roast beef on top of the sauce. You'll have to gage how much you can put on each piece by how thinly it is sliced. 4) Sprinkle each piece of roast beef with salt and pepper. 5) Top the roast beef with a cornichon. Dear Diane, This is easy. I am sure I would like this appetizer. I like horseradish with roast beef. I would think big and have the sandwich. It's a fabulous sandwich Catherine and a great appetizer too… enjoy and Merry Christmas. 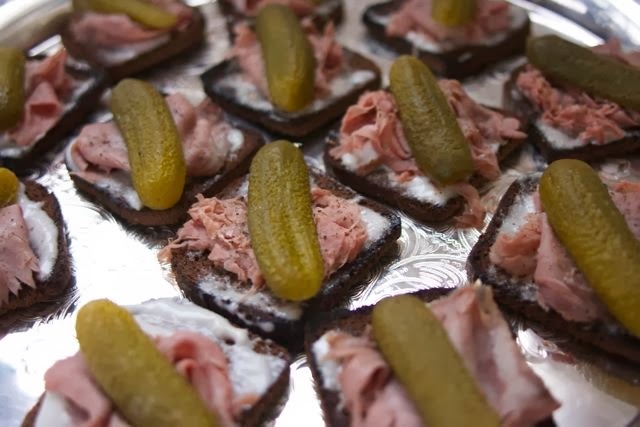 What a great little appetizer, I would eat all the pickles first! Thanks so much for sharing with Full Plate Thursday and wishing you abundant blessings in 2014! You can make it as a sandwich too... which is really delicious. 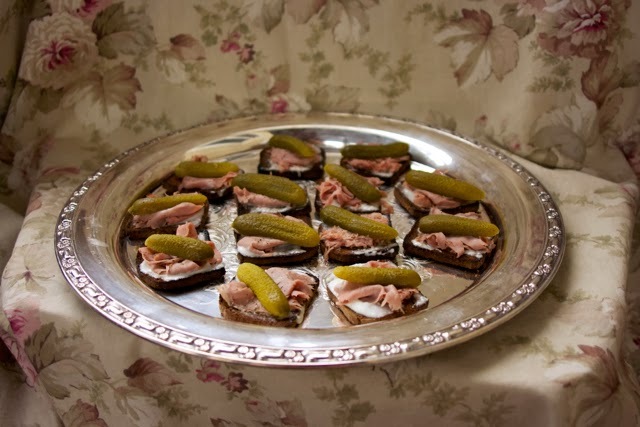 Always looking for a new recipe and love the idea of Roast Beef and pickle. Eye appealing and I bet delicious. Thanks, they did taste as good as they looked. I bet these would be a hit at a party, Diane! I love that they're so easy! Pinned - Thanks for linking up to Freedom Fridays! They were the first tray gone at a fundraiser I made them for. Thanks for pinning.